These SEA Airprene Hiking Waistlock 3/4 Pants allow for maximum upper body movement. It has a positive locking system so no suspenders required. 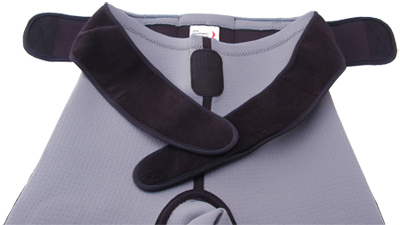 The elasticated back has a wide covering band which can be pulled in from both sides and Velcro locked to give support. You can quickly adjust to suit the level of support you want and to customize the fit and feel around the waist and back. Airprene Waistlock Shorts are perfect for summer conditions. The soft breathable perforated neoprene allows water to penetrate and cool the body. Battens are non-flex with double thickness industrial strength batten covering. They are sewn down into the material for a flush attachment, reducing catching as you move. I purchased the 3/4 waist lock hikers for my son and he loves them.. We had zhik hikers before and they just didn't last. New this year from SEA are their Waist-Lock Hiking Shorts and Pants. They"re a great addition to an already very complete lineup of hiking shorts, droop suits and wetsuit shorts and pants from Sail Equipment Australia. The SEA gear is well made and nowadays is towards the lower end of the hiker price range so it"s a great option for lots of sailors. I talk to a lot of customers in our shop who hate wearing full hiking suits during the summer months because they feel they"re too hot. Here in Annapolis it"s easy to understand why and I"m sure down in Florida it"s even worse. The new shorts and pants let you stay a bit cooler without sacrificing the comfort and extra hiking power you get from having battened pads. These shorts and pant hikers are made from SEA"s Airprene material, which is basically neoprene with a bunch of little holes punched in it. It helps keep you cooler than full neoprene hikers. Ok, so they"re not as hot, that"s great right but a little sweat won"t kill you so what else makes these hikers so great? SEA"s new hikers feature their Waist-Lock system which solves the perennial problem with non-suspender style hiking pants - they"re not always falling off you. Most hiking shorts and pants have some sort of draw string or Velcro waist that usually does an ok job as long as in between races and downwind you spend some time pulling the shorts back up. The SEA Waist-Lock system keeps your hikers in place all day long so you can hike hard. The Waist-Lock system works using 4 separate Velcro tabs. Two on either side of your hips that cross and lock together &amp; to the hikers in the front. Then two more tabs wrap around from your back and lock onto the other tabs. This system keeps the waist of the hikers snug all the way around regardless of how much you move around in the boat. All in all these are a great addition to the hiking options out there, especially for those folks who don"t like to wear the full suspenders style. I predict they"ll be the hottest new summer fashion for Laser sailors on the Florida circuit.